RIO DE JANEIRO, BRAZIL – With American football gaining popularity in Brazil and around the world, fans of game, those interested in learning more about the sport and American expats in Rio de Janeiro, will gather together in various locations in the city this Sunday, February 1st to watch the National Football League (NFL) Super Bowl XLIX. 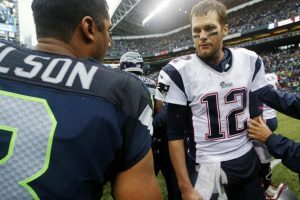 On Sunday, February 1st the world will gather to watch the National Football League (NFL) Super Bowl XLIX, image recreation. Marking one of the bigger events of the night, the American Society of Rio de Janeiro (AmSoc Rio) will host a Super Bowl viewing party at the JW Marriott Hotel Rio de Janeiro in Copacabana. The event will be complete with a live stream that includes the American commercials, and an appearance at the event by very special guest former NFL player Dan Upperco. The live game stream will be in English and will feature the pregame, the halftime show with Katy Perry and most notably, the original commercials that air with the game in America. Additionally, very special guest, former tight end for the Los Angeles Raiders NFL team, Dan Upperco will be present during the viewing party to help explain the game and to give an insider’s perspective of the teams and the ongoing plays during the game. 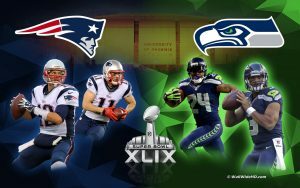 The New England Patriots are facing off against the Seattle Seahawks in the Super Bowl Sunday night, image recreation. One unofficial and popular rule of the sport is that no true viewing of a game, especially the Super Bowl, is complete without the appropriate food and snacks. For the event on Sunday, AmSoc Rio sponsor JW Marriott will provide a special “tailgate” buffet complete with hot dogs, sliders, french fries and nachos and cheese. The buffet is included in the entry fee of R$60 for AmSoc Rio members and R$70 for non-members. Additionally, there will be special promotional prices on buckets of beer throughout the night. The event will also feature a raffle and as always, Amsoc Rio promises very special prizes. During past events, they have given away airline tickets, dinners, handbags, accessories and more. The pre-game is scheduled to begin at 8PM local time and kick-off should take place at 9:30 PM. RSVP to the event is appreciated (e-mail: amsoc.events@gmail.com). All are welcome to attend and the event will take place on the first floor of the JW Marriott Hotel Rio de Janeiro located at Av Atlantica 2600 in Copacabana. Elsewhere in the city, various bars and pubs well known for broadcasting live sporting events also will host Super Bowl viewing parties on Sunday. The popular Mexican bar and eatery Blue Agave will host viewing parties in both its Ipanema and Copacabana locations. Also in Ipanema, Shenanigan’s Irish Pub & Sports Bar will live stream the game and offer 50% percent off Molly’s Wings and a buy four Heinekens and get six promotion. The Clover Irish Pub in Copacabana will broadcast the game live, as will the nearby Mab’s Restaurante and Bar. Finally for those planning to hold viewing parties at home, the Gringo Café in Ipanema is offering delivery in the area. Menu items include: spicy BBQ ribs, burgers, sliders, hot dogs, chili con carne, french fries, cookies, brownies and cakes. Whether it be at JW Marriott Copacabana, in restaurants, pubs, or in private homes and apartments, it is guaranteed that many will be tuning in to a different kind of football than usual on Sunday night in in Rio de Janeiro.